Casting a vote in Los Angeles County isn’t as simple as picking your preferred candidate for senator or governor and calling it a day. After the office holders, and all the state propositions, it’s time to get down to the county measures. If you’re wondering what all the alphabet soup means (statewide props get numbers; you’ll know the local measures because they’re labeled by letter) and why you really should fill out that portion of your ballot, read on. Several of the measures center around allowing individual cities within the county to raise (or maintain) local sales taxes. Voting “yes” on any of them authorizes that city to update the sales tax rate applied to purchases to generate revenue for the city’s general funds. • Measure A renews an existing San Fernando city sales tax of 0.5 percent (voting no would allow that tax to expire September 30, 2020). • Measure C increases sales taxes in Culver City by 0.25 percent starting in April. • Measure G allows Malibu to add a 2.5 percent tax on recreational marijuana sales–but also, perhaps more significantly, allows for recreational marijuana sales in Malibu from existing, permitted dispensaries which are currently medical only. • Measure I authorizes a 0.75 percent sales tax in Pasadena. Measure J, which follows it on the ballot, is a non-binding recommendation on how those new funds should be used; voting “yes” tells lawmakers you think they should commit one third of any new funds raised by Measure I to go specifically to public schools, while voting “no” trusts them to divvy up the new revenue at their discretion. • Measures L, P, R, S, CC, PG each enact identical 0.75 percent sales taxes in different cities: L is Lawndale, P is Burbank, R is Cudahy, S is Glendale, CC is Covina, PG is Pomona. • Measure Y authorizes a one percent sales tax in Santa Fe Springs. • Measure LP authorizes a 0.5 percent sales tax in La Puente. Amending the City Charter to Allow for Possibly Establishing a Public Bank in the City of L.A. Passage of Measure B would allow Los Angeles to move forward with exploring the creation of a city-run public bank. This bank would take in all the money the city raises for itself–sales taxes, parking meters, city fees–and hold onto it, theoretically saving the city some significant portion of the estimated $170 million in fees and $1.1 billion in interest currently being paid to private banks. Right now, only two public banks like this exist in the U.S., the banks of American Samoa and North Dakota. The one being proposed in L.A. would go a step beyond North Dakota’s, potentially offering certain types of low-interest consumer loans. Critics of the measure say there’s no precedent for a public bank quite like this, and that the city might be able to cut the fees it’s paying to Wall Street by simply negotiating better deals with existing financial institutions. A “yes” vote won’t immediately create the bank, but it will allow for an amendment to the city charter, which is step one. Three measures are on the ballot that would sync up local elections to statewide general and primary elections. The theory goes that holding elections for all offices at the same time would increase civic engagement with these down-ticket races. • Measure D would move city general elections in Culver City from April to November of even-numbered years, starting in 2020. • Measure E adjusts primary elections in the city of Los Angeles to match the March statewide primary date. • Measure EE aligns elections for Los Angeles Unified School District primary elections to the March date. The city of Duarte currently allows for the sale and use of certain kids of consumer fireworks for personal use. A “yes” vote on Measure F would ban individuals from buying or using all fireworks in that city outside the context of a permitted, public fireworks show, which is consistent with many–though not all–other parts of the county. Issuing a public bond works like this: The institution sells bonds to raise a certain amount of money they want for a project. If investors are interested in buying what the institution is selling (and, technically, there’s no guarantee they will be, but public bonds are historically considered a fairly stable investment) what they purchase is a promissory note that says they’ll be paid back after a fixed amount of time. To make good on those promises, bond issue measures typically also come with a proposal to raise property taxes. A “yes” vote for the bond measure gives the school district or other municipal institution in question permission to issue the bond and thus take on the set amount of debt and, if applicable, approves the tax increase that generates the revenue to pay back the loan. • Measure M authorizes Santa Monica-Malibu Unified to issue up to $195 million in bonds at an estimated tax rate of .03 cents per $100 in assessed property value. Measure SMS authorizes the same district to issue an additional $485 million at a rate of .04 cents per $100. The two measures appear separately relating to a plan that is expected to lead to Malibu breaking its schools off from the SMMU. • Measure AE authorizes Baldwin Park Unified to issue up to $69 million in bonds at an estimated tax rate of .06 cents per $100 in assessed property value. • Measure BB authorizes ABC Unified (which serves Artesia, Cerritos, Hawaiian Gardens, and parts of Lakewood, Long Beach, and Norwalk) to issue up to $258 in bonds to pay for facilities improvements at an estimated tax rate of .0495 cents per $100 in assessed property value. • Measure ES authorizes El Segundo Unified to issue up to $92 million in bonds at an estimated tax rate of .043 cents per $100 in assessed property value. • Measure HS authorizes El Monte Union High School District to issue up to $190 million in bonds at an estimated tax rate of .03 cents per $100 in assessed property value. • Measure LL authorizes Lowell Joint School District to issue up to $48 million in bonds at an estimated tax rate of .03 cents per $100 in assessed property value. • Measure WE authorizes Wilsona School District in Palmdale to issue up to $6.5 million in bonds at an estimated tax rate of .03 cents per $100 in assessed property value. • Measure CK authorizes Acton-Agua Dolce to issue up to $7.5 million in bonds at an estimated tax rate of .0147 cents per $100 in assessed property value. • Measure GO authorizes Mt. San Antonio Community College District to issue up to $750 million in bonds at an estimated tax rate of .025 cents per $100 in assessed property value. While not for a school district, Measure H works on a similar principal. A “yes” vote authorizes the issuing of up to $350 million in bonds to pay for repairs to the area’s existing hospital, building a new hospital, or patient care. The tax cost for that is an estimated $28.27 per $100,000 in assessed property value. Parcel taxes are similar to the kind of property taxes that are levied to pay back bonds, but they differ in how they’re calculated. Rather than being based on the assessed value of a home, it’s a fee per “parcel” (which could be a whole building, or a single square foot, depending on the measure), which generates revenue for a specific purpose. Bonds are often issued for construction and infrastructure, where parcel taxes might be used to fund other types of municipal needs. • Measure W is designed to raise money for the county flood district and pay for improvements in how L.A. gets its water. The county would charge a 2.5 cent tax for every square foot of a property which has been made impermeable to water. • Measure K authorizes a $189 per parcel in Culver City for seven years to fund school district programs. • Measure CS authorizes staggered parcel tax in Cudahy to fund public safety services for ten years. The tax would run $343 for single family houses, $556 for per dwelling for multi-family buildings, and $3,500 to $112,000 per parcel for other types of buildings. • Measure QS authorizes a tax of 10 cents per square foot of “improved property” in Burbank to fund educational programs. South Pasadena instituted a tax on utilities in 1932, and it currently generates around $3.4 million for the city–about 12 percent of the city’s general fund for the year. Voting “yes” on Measure N, that tax would be removed. Voting “no” maintains the status quo. Two measures on the ballot allow local governments to tax marijuana related businesses that operate in those cities. Measure CT authorizes Maywood to tax the companies at a rate up to 10 percent of gross receipts. Measure PC authorizes Pomona to tax companies at $10 per canopy square foot used for cultivation, and up to six percent of gross receipts for all other types of marijuana-related activity. In both cases, revenue generated would go into each city’s general fund. In addition to the school district and other measures on the ballot, Santa Monica has some other special matters to pay attention to this year. • Measure SM amends the city charter to require that, for the next ten years, approval of five city council members is required for any changes to the current Land Use and Circulation Element or Downtown Community Plan that would regard building height limit or floor area ratios. This would not impact buildings that are already in the pipeline. • Measure TL sets a three-term limit for city council members. Long Beach has every other city in the county beat for most city-specific measures in 2018. • Measure WW would require any hotel in Long Beach with more than 50 rooms to provide personal emergency communication devices to all workers, sets a max on the square footage a worker can be required to clean per shift, and establishes penalties for hotels that don’t comply with the regulations. 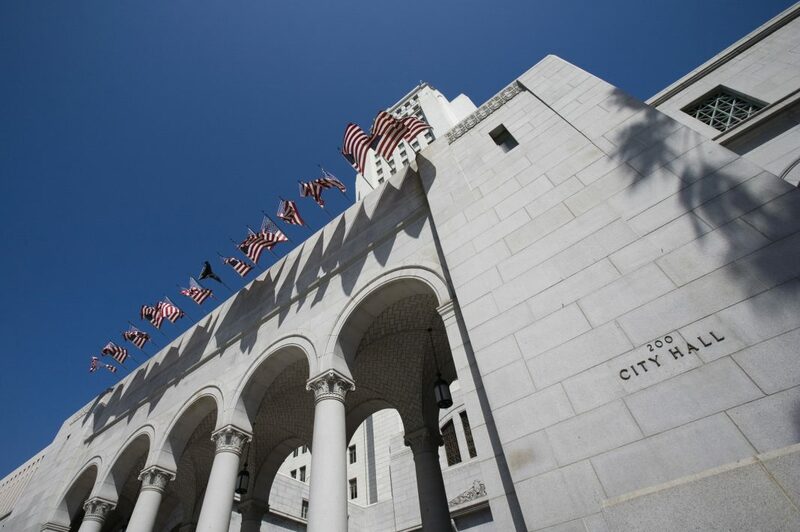 • Measure AAA amends the city charter to allow the city auditor’s office to conduct new, independant audits of city departments, boards, commissions, and offices. • Measure BBB changes the term limits for mayor and city council to three terms, total, closing a current loophole that allows for unlimited runs as a write-in candidate. • Measure CCC amends the city charter to set up a seven-member ethics commission. • Measure DDD would establish an independent citizens’ commission to oversee political redistricting in the city. Currently, the West Covina city treasurer and city clerk are elected offices. Measure T would make the treasurer role appointed by the city manager; Measure V would do the same for city clerk. Diamond Bar currently charges a 10 percent tax to guests staying in the city’s hotels. Measure Q would bump that to 14 percent. Right now, Carson is what’s called a “general law city.” A “yes” on Measure CA would change it to a “charter city” going forward. Passage of Measure U would institute a new tax on casinos and gambling operations in Cudahy. The tax would be set at 15 percent of total monthly gaming revenues. Previous articleWhen and Where Was Mickey Mouse Officially Born?